Meal planning for emergencies can be simplified if we adopted the same principles as the U.S. Military for making MREs. The meals are pre-planned, they are conveniently sealed and stored away for a later date. Granted, the lifespan of homemade MREs will not be comparable to the 10 year lifespan of government issued MRE’s, but they have a few advantages of their own. 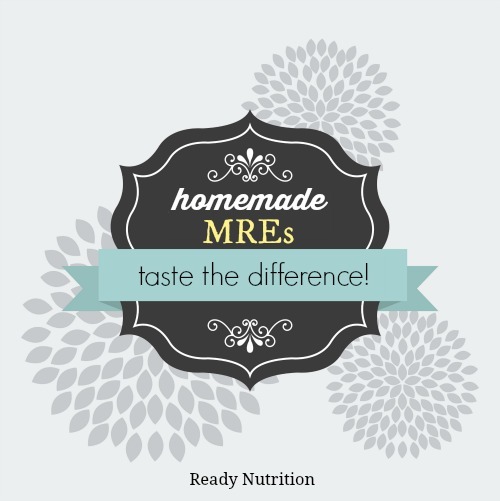 For one, making your own MREs is less expensive and they have fewer preservatives, thus causing fewer intestinal back ups. And, of course the most important advantage is they taste better. If you have certain food allergies or other dietary requirements, it would make more sense to make your own rather than gamble on an allergy flare up. With the homemade versions, you also have the benefit of having a re-usable bag, which can be used for carrying water, or being used to boil other foods. As this site notes, MREs manufactured since 2005 are of equal quality and caloric value as military MREs. They now average about 1,222 calories per meal. The typical MRE entrée has crackers (pilot bread), spread to put on the crackers, a side dish, dessert or snack, powdered beverage and an accessory pack with matches, gum, instant coffee, creamer, sugar, salt, moist towelette and toilet paper. All of these contents are packed into a sealed heavy plastic bag. You can easily create a similar version by vacuum sealing your items or sealing them in a Mylar bag. With a little searching you can find most shelf stable foods in single serve packets. This also cuts down on the food enemies. To buy single serve packets in bulk, I went to Amazon.com where they have everything from packets of water and meats to packets of dehydrated vegetables. As with all emergency food supplies, you want to keep some basics in mind with the foods you decide to store. Find foods that are just add water meals or no cook meals to help you conserve your emergency supplies. Remember to purchase foods that are shelf stable and have a longer shelf life. Further, save those plastic utensil packages and condiments from your take out orders. In no time you will have an ample supply of them to use toward your homemade MREs. Purchasing these foods in bulk can save you some money in the long run. As mentioned previously, homemade MREs will not have a comparable shelf life to their commercial counterparts. But if you are resupplying your food pantry, you could easily rotate these in as meals. Some MRE food suggestions are below. Add meals to a vacuum sealed bag or Mylar bag. Flatten your assembled MRE’s as much as possible (without damaging the packaging) and seal them thoroughly. Ensure that you label the contents along with the packing date to stay organized. It would also be proactive to list the best by date. Making your own emergency meals is a convenient way to store a balanced amount of shelf stable foods for a rainy day. Keep the above suggestions in mind when you are planning your homemade MREs and you will have your emergency meals ready in no time. Do you have estimates on the shelf life of simply placing ramen, or granola bars into mylar bags with the proper oxygen absorber?